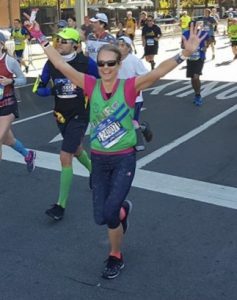 THERE is something about the New York City Marathon that is a magnet to runners. It is not the oldest modern marathon, that accolade goes to Boston; neither is it the prettiest, London or Paris are more scenic; nor even the fastest — the world record was broken at Berlin this September. 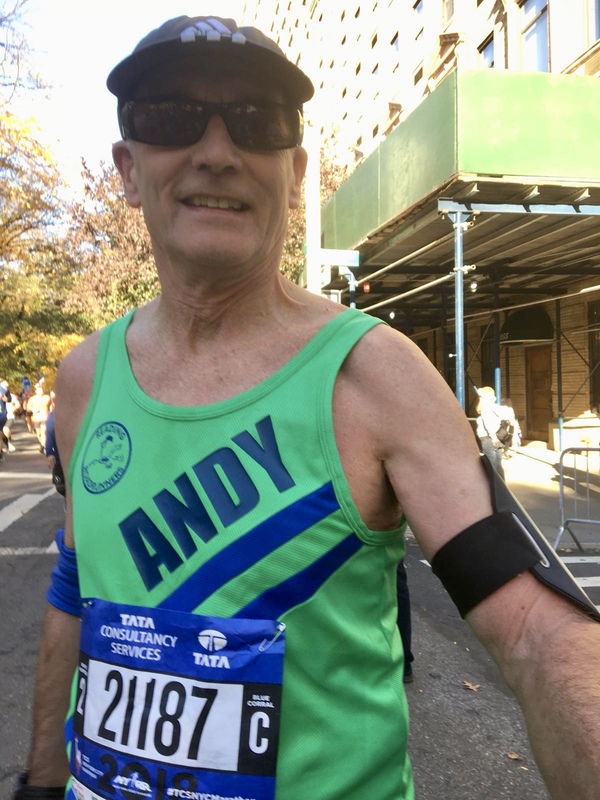 But running in the Big Apple is exciting — just reciting the names of streets, bridges and districts conjures up images from stage and screen and have you humming a Sinatra hit. 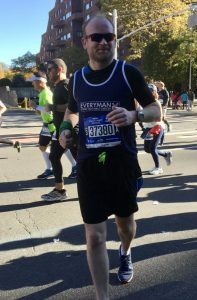 The run takes in First and Fifth Avenues, Upper East Side, Brooklyn and the Bronx, the Verrazzano and Queensborough bridges. Canyons between high buildings, car horns, police whistles, daylight at midnight and rattling subway trains all signal that this really is the city that never sleeps. So it was that a group of Reading Roadrunners found themselves with a common purpose in New York. Whether by ballot, good for age, or sports tour, we were each keen to tick this one off our bucket lists. We already had an inkling that this was not to be a walk (or should I say, run) in the park — prior choices had to be made for getting to the start on Staten Island — on the bus or ferry around 6:30am. Added to the usual jet lag, this meant that there would be little sleep the night before. 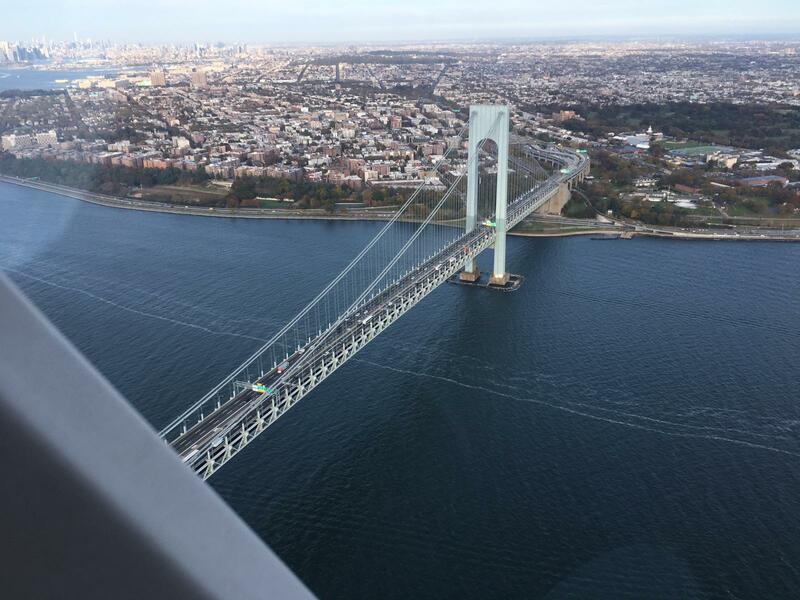 Another hitch was that the run starts with a mile-long climb on to the Verrazzano Bridge, and some testing climbs thereafter. Reading Roadrunners, being notoriously sociable, also compounded the task by meeting for a last supper the night before. There is still no consensus on whether wine with the meal improved or detracted from performance on the day. From the results, there was no discernible correlation either way. Reservations about the run were demolished at the start. The day dawned cool, bright and clear, with stunning views of the city from the Staten Island ferry. After the usual interminable hanging around which accompanies big races, we were lined up at the foot of the Verrazzano Bridge in much the same way as an aircraft pulls up at the end of a runway. The equivalent of jet engines spooling up for take-off was the cranking up of “New York, New York” and we were off. Unfortunately for me, I got carried away by the enthusiasm of my (rather fast) accompanying runners and went out too quickly. That was despite advice the day before from experts at the Expo not to do just that. I only wish I had done as some did — relax, enjoy the stunning views and, maybe take a few selfies! My fellow Reading Roadrunners did much better, with Fleur Denton (below) coming in at under four hours. Catherine Leather and Liz Ganpatsingh both turned in times around the four-hour mark and Vroni Royle achieved a stunning PB at 4:26.31. Christina Calderon ran a practically identical time of 4:26.39 and Ian McGuinness 4:32.56. Phil Reay and myself both ran around the 4:50 mark, but I suspect that Phil went out more sensibly and, consequently, felt far less pain than me. I hardly think he could have endured more pain, but he is an ultra-runner, so you never know. Anthony Eastaway substantially improved on his Berlin marathon time, coming in at under six hours. Our group included guest Tri20 and former RR, Edwina McDowall, who ran a brilliant 3:01.09 and Mary Wilson from Reading Joggers, who ran 5:42.14. With exceptionally fine weather, the city looked superb and New Yorkers were out in force. Brooklyn, Queens, the Bronx and Harlem all responded with bands and singers, and crowds waving placards . “You are running better than the White House” was my favourite. As borough boundaries were crossed, so shouted greetings were renewed. A particular memory of mine was a six-row deep gospel choir outside a church in Brooklyn bursting into song just as we passed. Drawing towards the end, at the foot of the Madison Bridge, a clearly heard chant was “last damn bridge, last damn bridge”. 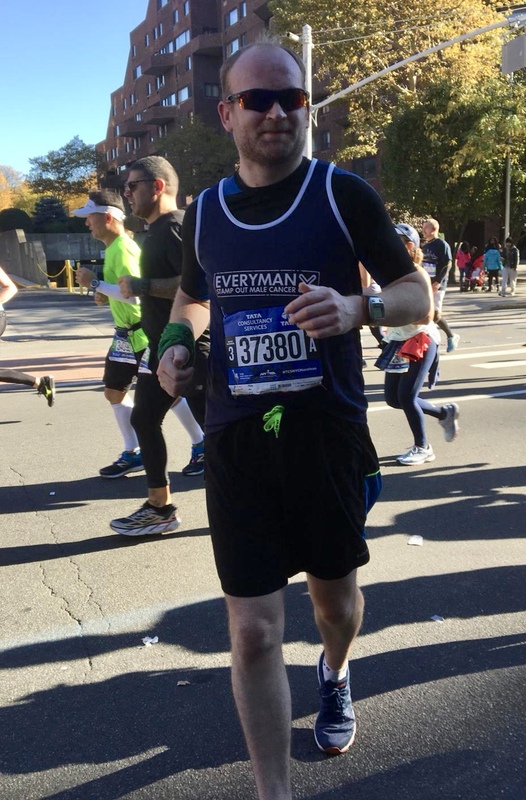 To finish, you run down Fifth Avenue and into Central Park — not something you can do every day of the week, but by then I don’t think many of us were taking in the view. At this point, support from loved ones can make all the difference. 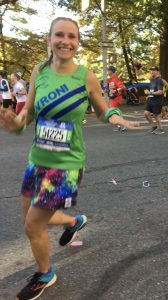 My wife, Liz, and her sister, Rosemary, were out on the course at mile 19 on First Avenue and then, after a quick sprint across Harlem, at mile 22 on Fifth. Liz later told me that she had run/walked a half-marathon just following our group. But it was worth it for the cheers and hugs. Finally, spurred on by an increasingly numerous and noisy crowd, the end was in sight — just enough strength left for that last little sprint… not! 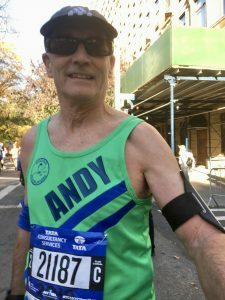 Andy’s verdict: The New York marathon is a deceptively difficult run. Although it contains no steep hills, it consists of a series of inclines. Many of these are long approaches to bridges, or, in the case of the Verrazzano, over the iconic bridge itself (pictured below). In Manhattan, the run up First Avenue is a long rise and comes well after the mid-point, thus seriously testing stamina. Once in Central Park, although the net relief is downhill, the uphill parts are demanding. New York Roadrunners produce a useful map showing how our splits worked out and it is fair to say that we all ran a much slower second half. Many commented that things got seriously difficult after mile 14. We were blessed with fine weather, and the run would be less attractive on a more typical November day. But, even so, the city, support and spectacle would make up for poor weather and tough topography. New York City rightly sits at the top as a marathon major. A fuller version of this report will appear in the club’s November newsletter next week. Posted in Dibben Report, Race Reports, Roadrunners18, Uncategorized.